We’re introducing an award that will show your customers and contacts you’re one of our best performing Trusted Traders. It’s not easy to become a Which? Trusted Trader. But we know that some businesses really go the extra mile to make the most of their endorsement. These traders make great use of the logo, take any actions needed to complete their endorsement quickly, provide excellent customer service and get a steady stream of reviews on their Trusted Traders profile page. 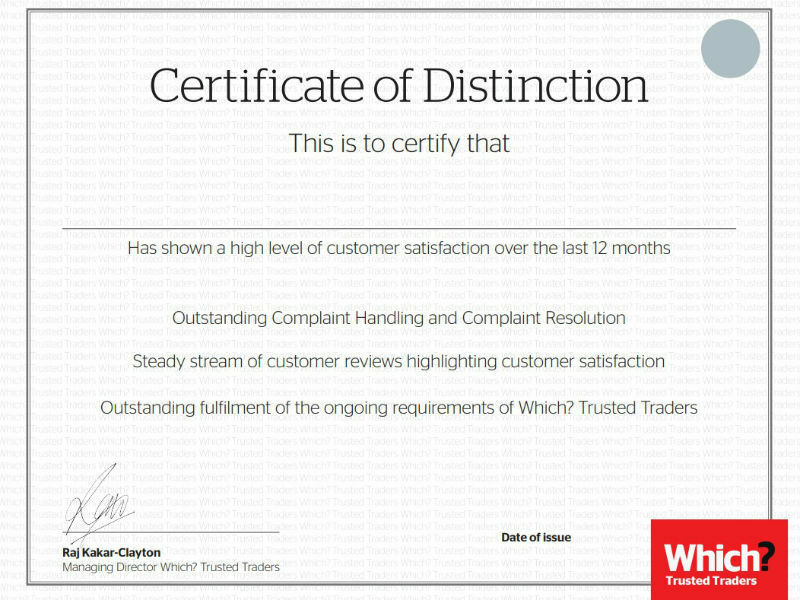 To recognise those traders that perform to the highest standards, we’re launching a ‘Certificate of Distinction’. You’ll potentially be eligible to receive it on the anniversary of your endorsement, based on your performance on the scheme over the previous 12 months. Give your customers confidence that they’re buying from a business they can count on. Become a Which? Trusted Trader. Which? Trusted Traders automatically receive a ‘renewal certificate’ every year to confirm your endorsement for the next 12 months if you’ve maintained your Trusted Trader status. The Certificate of Distinction will be an extra bonus that a select few traders will receive after their anniversary, if they meet the criteria. complied with the terms and conditions of the endorsement scheme at all times. The certificate is a measure of your performance over the past 12 months. It’s not easy to reach the required standard, so if your business receives the certificate, congratulations. It’s an achievement worth celebrating. If you don’t receive the Certificate of Distinction, don’t be disheartened. You didn’t quite meet the criteria this year but the good news is, you still have a chance to get the certificate next time. Each year, on the anniversary of your endorsement, we wipe the slate clean and you can start working towards the required standard for the next 12 months.